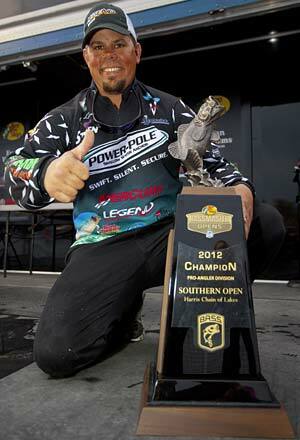 Chris Lane wins the 2012 Bassmaster Southern Open on Florida's Harris Chain and a spot in the 2013 Classic. Photo Credit: B.A.S.S. Citing the need to slow down and fish his areas thoroughly, Lane used a variety of baits to claim the title and a provisional berth in the 2013 Bassmaster Classic on Oklahoma’s Grand Lake o’ the Cherokees, Feb. 22-24. If Lane fishes the remaining two events in the Southern Open season, he’ll cement the spot in bass fishing’s greatest championship. Day Three’s big bass belonged Keith Carson of Debary, Fla., and weighed 9-13. Garneau Baits pro staffer Luke Gritter from Kalamazoo, Michigan finished in 8th place with a 15-bass 3-day total of 44-13 after weighing in 5 bass for a little over 13 pounds the final day. Chris Bowes says, "We always joke that Luke Gritter is the most popular angler to come out of Kalamazoo, Mich."
2012 Bassmaster Opens Official Sponsors: Toyota, Bass Pro Shops, Berkley, Humminbird, Mercury, Minn Kota, Skeeter Boats, Triton Boats, Yamaha. 2012 Bassmaster Elite Series Supporting Sponsors: BoatUS, BOOYAH Bait Company, Lowrance, Luck “E” Strike, Nitro Boats, Power-Pole.